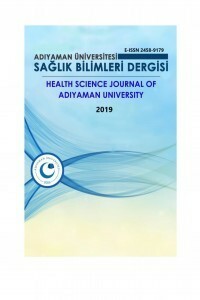 Health Sciences Journal of Adıyaman University; published three times a year. Health Sciences Journal of Adıyaman University is a international journal. Writting language Turkish and English, which accepts editorial letters and invited collections, including original clinical and experimental research papers, case presentations and published written reviews. Health Sciences Journal of Adıyaman University is an open access e-journal. In the process of review and publication does not charge any fee. Doğum eylemindeki gebelerde intravenöz parasetamol kullanımının analjezik etkinliği; prospektif, randomize kontrollü çalışma.